For the following schemes 1-30 by mechanisms known characteristics of movement of the load 1 - speed and acceleration A1x V1x, or for a given equation of motion of the body 1 - x (t), or for a given equation of motion of the shaft 3 - F3 (t) to identify and show Figure velocity and acceleration of the point M and the velocity and acceleration of the load 1 in a given time. Input data, including the radii of gears, pulleys, drums, are shown in the table. 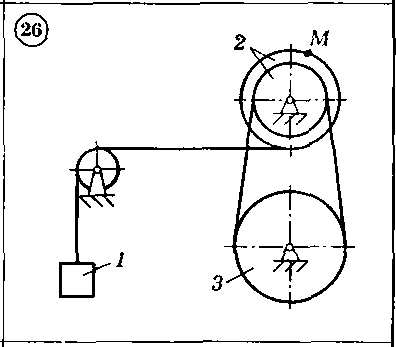 Right after the payment you receive a link to the archive with the solution of the problem in theoretical mechanics K2 B26 (Figure26) in the test book "theoretical mechanics" Dievskaya VA Malyshev IA 2009 for university students.